In 1987, Tomahawk Film Music produced our exciting 90 minute ‘Adolf Hitler’s Combat Newsreels’ video, (and latterly on DVD), collection of original & previously unseen Deutsche Wochenschau Nazi propaganda 16mm film that had originally been ‘liberated’ by a former British Intelligence officer from a Gestapo HQ in Hanover, Germany in 1945, during the final months of the Second World War. 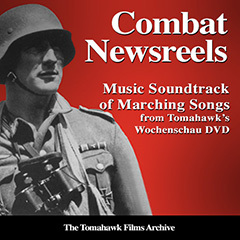 Silent footage as it all was, Tomahawk's producer Brian Matthews located a truly stunning selection of famous war-time marching songs that had been re-recorded, post-war, by the Bundeswehr’s elite 11.Panzer-Grenadier-Division Musikkorps und Chor to bring this truly action-packed combat footage to life. Since then, our customers all over the world have been regularly asking if this stirring sound-track was actually available to buy as a separate Music CD, to which the answer was always, sadly, ‘No’ as we were only ever specialising, specifically, in military and civilian music that had been recorded during the years of the Third Reich, from 1933 to 1945.